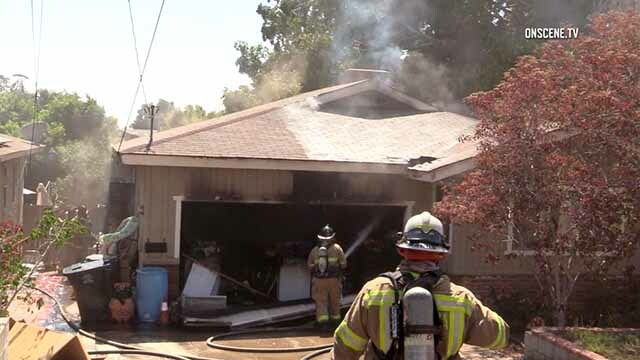 Flames spread through an attached residential garage in an East County neighborhood Tuesday, destroying a parked car and causing enough smoke damage in the adjacent house to displace the sole resident. The blaze in the 8200 block of Golden Avenue in Lemon Grove broke out for unknown reasons about 12:45 p.m., according to Heartland Fire & Rescue. The woman who lives in the home was able to escape the burning structure along with her seven dogs and two cats, fire Capt. Sonny Saghera said. None of them was injured, he said. Crews had the flames under control within 15 minutes. The blaze caused an estimated $100,000 worth of monetary losses. Among the losses was a non-operational vehicle gutted by the blaze in the garage. The resident told firefighters she would be able to stay with a friend pending repairs to her home, Saghera said.